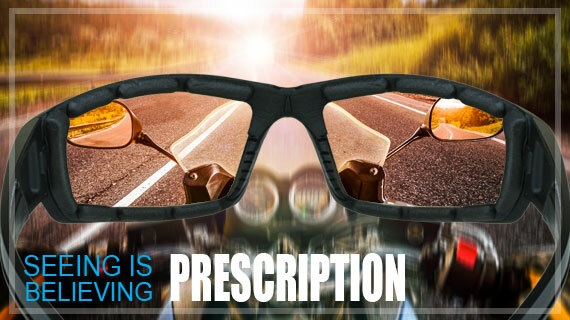 Prescription Motorcycle Glasses: What’s Important to Know? 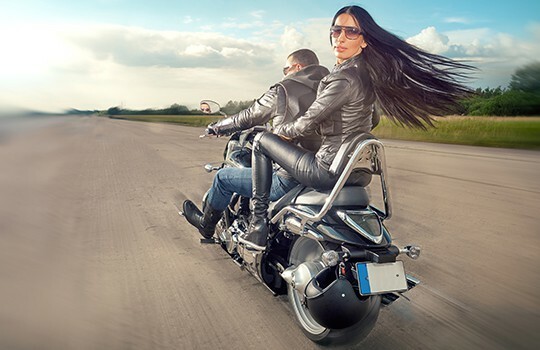 With over a decade of experience, Bikershades can make prescription motorcycle sunglasses just for you. Your eyeglasses are not aerodynamically designed and will shake and wiggle. The glasses will eventually fly off your face at higher speeds. They have a very low base curve, and do not block wind from the top, bottom or sides. Wind entering your frames will dry out your eyes causing temporary blindness. The nose pieces will dig into your eyes from wind pressure at higher speeds. Your lenses are probably made of plastic, and not impact resistant or safety rated. Plastic lenses can shatter. 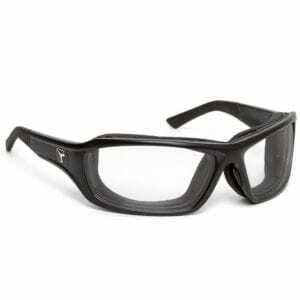 Your optometrist does not carry frames specific for motorcycle riding. Their lab does not have the expertise to cut lenses for high wrap frames. Their prices for cutting high wrap glasses will be extremely expensive. They may try to sell you lens options you really don’t need. So, we have explained the reasons why you need glasses made for motorcycle riding and why your local optometrist may not be your best choice. Let’s dive into the lens options you really need. If you don’t want your glasses to fly off your face, aerodynamic high wrap frames are a must. High wrap frames contour around your face and they also make contact with the entire area around your eye. You should feel the frame touching your brow area, around your nose bridge, and along your cheekbones. This contact will ensure a snug fit; sealing out wind, dust & debris. If you wear a helmet, high wrap frames will also fit closer to your face so they will fit comfortably. If you haven’t tried biker glasses with foam cushion, then we highly recommend you do so. The foam cushion is attached to the inside of the frame and makes contact with your face. Wiley X and 7eye feature frames that have removable foam, in case you decide to wear them as regular sunglasses to walk around. It’s also nice to remove the foam when it’s really hot outside. BikerArmour sunglasses have a built-in sweatproof foam that is not removable. However, since the foam is water resistant and sweat proof, BikeArmour frames are comfortable to wear all the time. Plus, BikerArmour frames are 60 – 80% less expensive than WileyX and 7eye for comparable performance and quality. 7eye Panhead Motorcycle Sunglasses with removable foam. Now that you understand the importance of wearing sunglass frames that are designed for riding, the next step is to determine the type of prescription lens and options that are most important to you. What Lens Material is Best? There are two lenses materials to choose from, Polycarbonate or Trivex. Yes, there are other lens materials such as Plastic or Glass; but these materials are not impact resistant, and can shatter or break. We recommend plastic or glass lenses only for casual use, not for riding motorcycles. You can compare polycarbonate to Toyota and Trivex to a Lexus. Both are great, but Trivex is better. 1. Polycarbonate offers 100% UV protection, plastic lenses do not. 2. Poly is highly impact-resistant and light weight. 3. The lenses are about 10 percent thinner than Trivex and plastic. 4. They have excellent transparency and high refractive index (it can bend light to a higher degree than glass or plastic of equal thickness). 1. 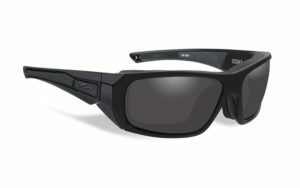 Trivex offers 100% UV protection, plastic lenses do not. 2. They is the most impact resistant material available. 3. The lenses are the closest in clarity to glass – the clearest medium on earth. 4. Higher Optical Clarity (center): Trivex lenses have less internal stress in the center of the lens which results in better optics. 5. Higher Optical Clarity (peripheral): Trivex lenses have a higher Abbe value which results in sharper peripheral vision and less chromatic aberration than polycarbonate. What Lens Type (Color) Should You Choose? There are 3 primary types of lenses to choose from: Transitions, Polarized or Solid Tints. Some questions to consider are: What time of day do you ride the most? How sensitive are you to bright light? If you ride both in the day and night, we recommend Transitions Brand lenses. With Transitions, you will need only 1 pair of motorcycle glasses to ride in the day and the night. The lenses will be dark grey in the day and totally clear at night. 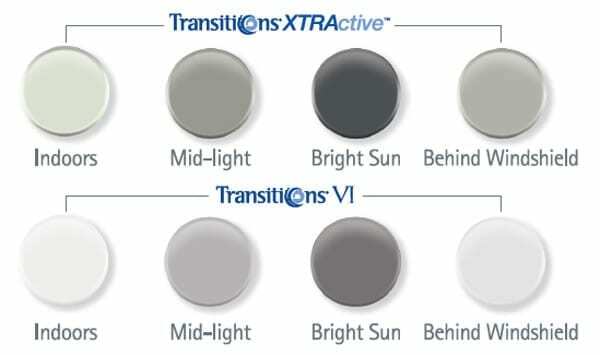 There are three Transitions lenses to choose from, Transitions Signature, Transitions XtrActives and Transitions Vantage. Xtractives get darker than any Transitions lens on the market today. In full sunlight, the lenses will get as dark as your daily sunglasses. XtrActives also darken slightly behind the windshield of a car. Revolutionary Lenses with variable polarization: Vantage Lenses polarize and darken when exposed to the sun’s UV rays. Your vision will get crisper, sharper and more vivid as the lenses get darker. This is because polarized lenses virtually eliminate glare from shiny surfaces such as chrome bumpers, mirrors, water and windshields. Polarized lenses are also very popular amongst fishermen because they can see the fish beneath the water. If you are sensitive to bright light or want to eliminate glare, you will enjoy the clarity and comfort of polarized lenses. 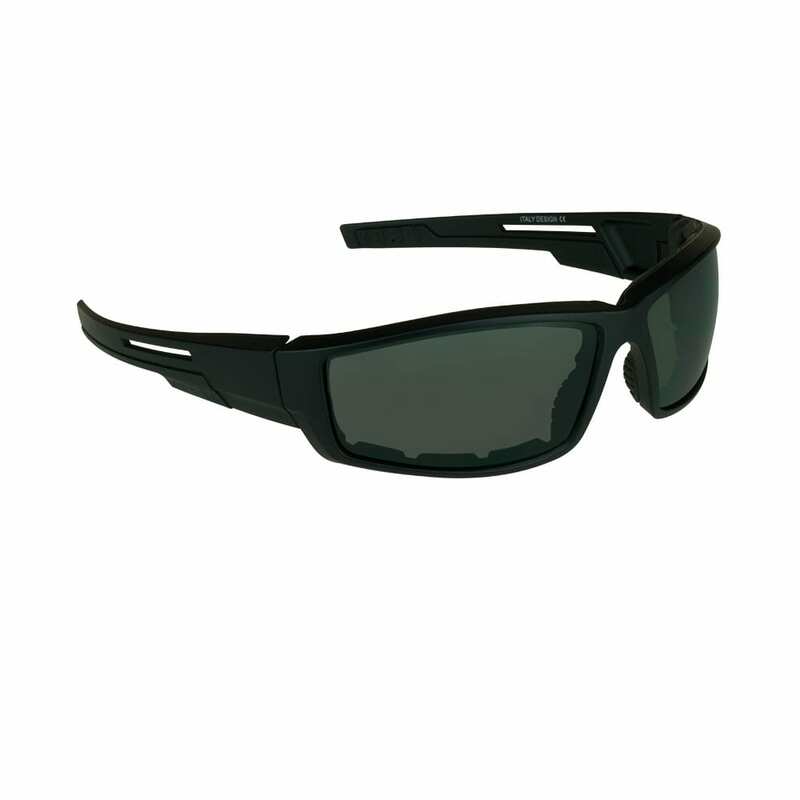 Polarized lenses eliminate glare off shiny surfaces such as chrome, water, mirrors, etc. Fishermen love polarized lenses because they can actually see the fish beneath the water! If you only ride in the daytime, Solid Tint lenses are a good choice for you. The most popular color for day time riding is dark grey or dark brown. However, there are many lens colors to choose from. Clear and Yellow are the most popular colors for night riding. Following are a list of popular colors to choose from. Dark Grey: Dark Grey is the most popular lens color. They are excellent for every day use. Dark grey is the darkest tint and filters the most light. It offers true color perception, and also reduces glare. Dark Grey lenses are excellent for driving, baseball, tennis, football, soccer, water sports, and all other outdoor activities. Works well in all light conditions, sunny or cloudy. Dark Brown: Improves contrast and contains a red element to enhance depth perception. Excellent for golf, tennis, high-altitude sports, fishing, boating/sailing, or any sport where distance needs to be judged. Works well in all light conditions, sunny or cloudy. G-15 Smoke/Green: G-15 lenses were made popular by the Ray Ban Aviators. G-15 Lenses emphasizes colors our eyes see most easily (green and yellow) and de-emphasizes less noticeable colors (red and blue). The G-15 lens absorbs 85% of visible light, and transmits only 15%. The G-15 lens results in more natural vision – true colors that are easy on the eye. Yellow: Provides greater clarity in fog, haze, and other low-light conditions. Yellow filters out blue light that can make focusing difficult. Great for skiing, mountain biking, hunting, aviation, tennis, and target shooting. Yellow is popular because it eliminates the halo effect around lights at night. Also good in foggy or hazy conditions. Clear: Excellent choice for night riding. Provides the most natural vision and also offers 100% UV protection. We recommend adding an anti-reflective coating which eliminates the halo effect around lights if you ride at night. Green: Great lenses for general purpose and transmit colors evenly. Dims glare while brightening shadows. It is good for all outdoor activities in cloudy and sunny conditions. Rose: Enhances visual depth and provides good road visibility. Rose reduces eye strain as it improves contrast. Can be used for cycling and skiing. Good in most weather conditions, especially in snow. Should Anti-Reflective Coatings be purchased? More than likely, the last time you purchased glasses the optician recommended an Anti-reflective coating. You were probably thinking you were being pushed to buy a useless upgrade, or perhaps just a way for the optician to earn commissions. Well, good news is Anti reflective coatings are actually money well spent. 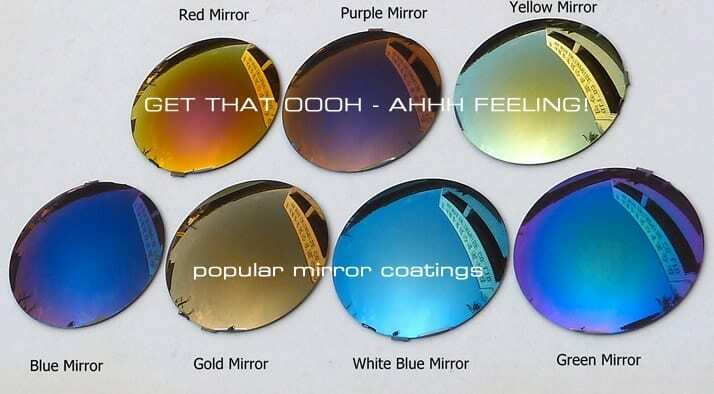 So, what is Anti-Reflective (AR) Coating? Anti-reflective coatings include scratch resistant coatings, hydrophobic & oleophobic coatings. AR coatings block reflected light, which results in a reduction in glare, annoying reflections and halos around lights at night. They reduce the glare that you see from shiny objects, as well as the glare that others can see on your lenses. If you look at someone wearing glasses without Anti reflective coatings, you will see a reflection and their eyes will be barely visible. 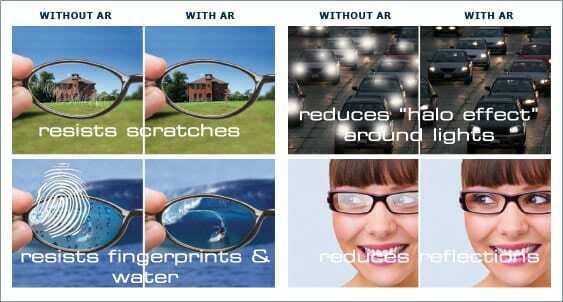 AR coatings also provides clearer vision because it lets more light (not UV rays) through the lens. This is the reason why AR Coatings are also recommended if you use a computer, or if you ride a motorcycle at night. Anti-reflective coatings also include a permanent oleophobic and hydrophobic coating which resists water and fingerprints. These coatings also make lenses easier to clean and maintain with a simple lens cleaning cloth. Finally Anti-reflective coatings include an anti scratch coating which is normally purchased separately. But when you purchase an anti reflective coating, there is no need to purchase a scratch coat. So, you will save some money here. These scratch coats will prolong the life of the lenses and protect your lenses from coins, keys, and maybe dropping the on the ground. However, scratch coats normally will not protect your lenses if they are dragged across asphalt or concrete. Should You Purchase Anti-Scratch Coatings? If you do not purchase an anti-reflective coat, we strongly recommend to at least purchase a scratch coat. Prescription grade scratch coats are double dipped & thermally cured. These scratch coats will prolong the life of the lenses and protect your lenses from coins, keys, and occasionally drop. However, scratch coats normally will not protect your lenses if they are dragged across asphalt or concrete. Not everyone experiences foggy lenses, but if you do, an anti-fog coat can be a lifesaver. Anti-fog coatings are permanent and thermally baked on the surface of the lens. Some anti-fog lenses require the wearer to apply an activation solution to the lenses with a cleaning cloth to activate the Anti-Fog properties. The anti-fog properties will stay active for several days. If you are a biker, Anti-fog is incredibly helpful in cold winters when you are stopped at a red light. Read this article for more information on Anti-Fog Coatings. So, purchasing a pair of prescription motorcycle glasses online can be a cinch once you understand the options you really need. It all really depends on the conditions you normally ride in. If you are watching your budget, then we would recommend you at least select polycarbonate lenses, Transitions XtrActives, and a baseline Anti-Reflective Coat. Once you get your prescription, feel free to give us a call and we can help walk you through the process if you have additional questions.